How Will Additive Manufacturing Disrupt With Metal Printing? The ability of additive manufacturing (AM), otherwise known as 3D printing, to print objects layer by layer directly from a computer design is set to be game-changing. Yet, despite considerable media attention, it has not yet led to wide-scale transformation of manufacturing practices across the world. The promise is better products with improvement taking many forms, including greater choice, enhanced performance and durability, and weight reduction. Users receive goods more quickly because the production cycle is faster, and manufacturing can take place in more convenient locations. Highly specific tools are not required, and there is far less waste than with traditional manufacturing methods. The industry has developed rapidly, albeit from a small base, and that momentum shows no sign of slowing. 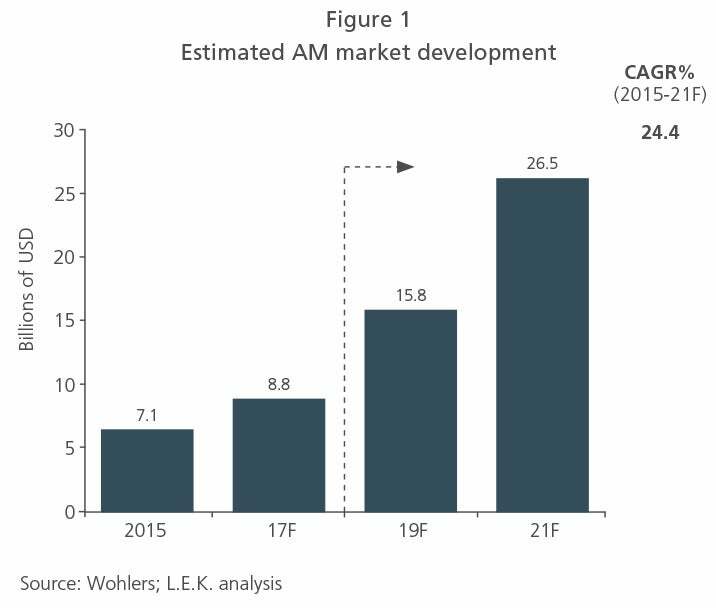 Currently valued at $7 billion to $9 billion, the global market is expected to be worth in the region of $26.5 billion by 2021, representing a compound annual growth rate (CAGR) of 24.4% over the preceding six years (see Figure 1). Traditionally metal-based AM has constituted a tiny fraction of the market, which has been dominated by photopolymer and thermoplastic materials, but it is growing fast, providing exciting opportunities for industrial sectors in particular. It is uncertain when metal printing will reach the levels of speed, consistency and cost that make volume production commercially viable for mass-market industries, such as automotive. While that moment is unlikely to arrive imminently, when it does, the current manufacturing landscape will be significantly disrupted. To prepare for the disruption ahead, operators and investors with limited participation in metal AM, and those that are considering entering the market, should be assessing now how best to leverage the opportunities ahead. To develop competitive strategies, they need to understand the potential end-use markets for AM products and their value chains, to ascertain the likely inflexion points in the short, medium and longer terms. Six distinct segments of the AM value chain cover pre-manufacturing, manufacturing and services (see Figure 2). The most important of these is pre-manufacturing, where the highly complex translation of part requirements into drawings and 3D models (using design, scanning, printing and inspection software) takes place. A number of leading businesses have emerged in this segment. The value chain has been incredibly dynamic in the past few years and dominant suppliers have emerged, sometimes following mergers and acquisitions. Autodesk and Materialise are now the go-to software companies, and some organizations operate across segments — Stratasys, for example, specialises in AM printers and post-processing treatment. Some AM printer manufacturers also provide metal powder, but as the market develops they are opening to third-party powder providers. The value chain will continue to evolve rapidly and, in the end, significant disruption will be caused by an increase in AM unit efficiency, driven primarily by declining material input costs and the elimination of multiple production steps. Suppliers will be disintermediated, especially in the production and post-processing phases. Processes will need to be redesigned and reintegrated to ensure a seamless operation of the end-to-end value chain. Integration could be fully internalized or established through partnerships, and original equipment manufacturers (OEMs) in particular will need detailed knowledge of each element of the value chain. Intellectual property control and software and design capabilities will be especially critical. The increased efficiency of manufacturing and new/improved products through AM will trigger shifts in product demand, which need to be anticipated and managed accordingly. Two near-term opportunities are the production of industrial spare parts and product refurbishment. 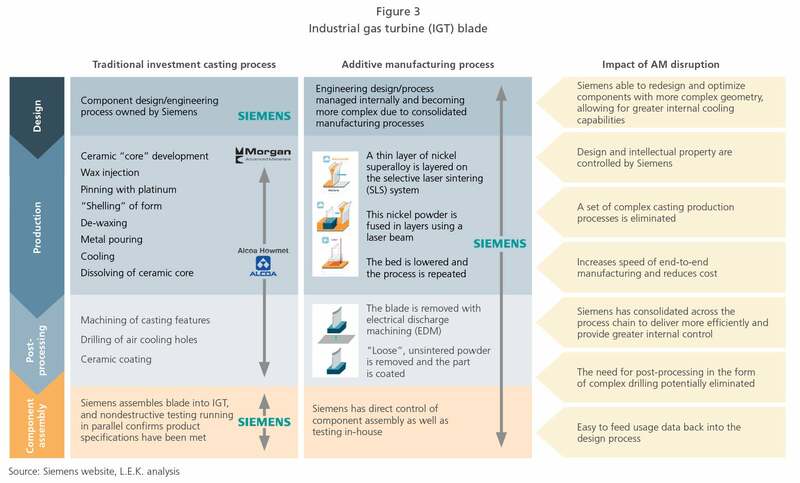 Siemens’s breakthrough AM industrial gas turbine blade, announced in February 2017, provides an early indicator of the potential impact of fully integrated AM from design to post-processing (see Figure 3). The company developed the prototype turbine blade to test the ability of AM-manufactured parts to withstand high stress loads (including physical pressure, temperatures and rotational forces). It was successful in installing and testing the blade in a turbine, and now produces the product commercially for its turbine aftermarket. The entire process was complete in just 18 months — far faster than would be possible using traditional manufacturing methods. In addition, Siemens is now able to feed its parts usage knowledge back to its engineering and design departments to further optimize its future AM processes. Siemens has also successfully used metal AM to maintain turbine burner heads. Previously, the company repaired worn heads by removing a large part of the product before rebuilding it with traditional methods. Now, using AM, Siemens removes just a fraction of the head and prints the replacement material onto the burner. This process has reduced repair time from 44 to four weeks, increasing customers’ efficiency and reducing their maintenance costs. GE is another company that is pioneering the use of AM through full process integration. It has invested $1.5 billion in the technology, including $50 million in a factory in Alabama to print fuel nozzles for its LEAP jet engines (anticipating 35,000 nozzles a year by 2020). The new single-unit product replaces earlier versions of the nozzle, which used 20 components and were 25% heavier and 500% less durable. This reduction in weight has resulted in airline customers benefiting significantly from reduced fuel bills. While the metal AM market is nascent, GE, Siemens and Michelin/Fives with AddUp are not the only examples of innovative manufacturing. A variety of metals are used in a wide range of applications across aerospace, automotive, maritime, medicine and dentistry, and many other industries. However, most metal-based AM has focused on complex and high-value small to medium-size parts that do not need to be printed in volume — parts like those in the GE and Siemens examples. One of the main reasons for this is the dominance of powder bed fusion within AM, whereby thermal energy fuses regions of a metal powder bed. This technology represents the majority (about 80%) of the installed metal AM printers. But a newer printing technology, known as direct energy deposition (in which products are created by melting the metal), is becoming increasingly available. Enabling faster production and the printing of bigger and more complex units at a lower cost than powder bed fusion, this technology is acting as a catalyst for further innovation in metal AM usage. Mass production of industrial metal parts by AM may not be here for some time, and it is unlikely to lead to the wholesale replacement of traditional manufacturing, but technology developments are opening up a broad range of possibilities. There will be significant disintermediation as the multiple steps necessary for traditional manufacturing are reduced. For OEMs, ownership of highly sophisticated software will be critical for the optimization of product design and process control. Increased integration of capabilities across the value chain will also be vital, and much of this can be achieved through strategic partnering. This is a market of evolution, not revolution, and one that requires manufacturers to revisit their business model and define the core capabilities needed to successfully develop an AM operation.